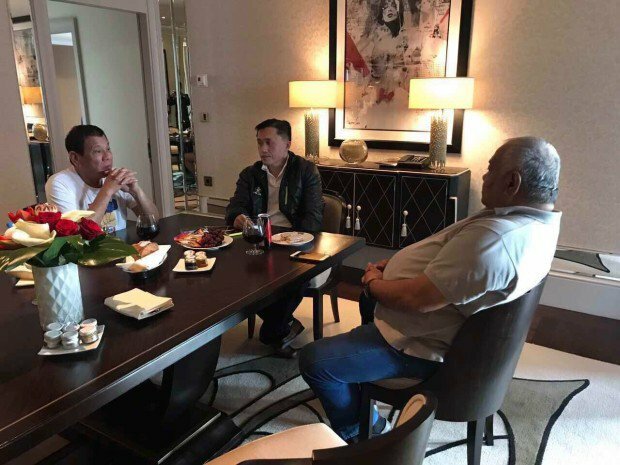 The president meets Executive Secretary Salvador Medialdea and Assistant to the President Secretary Bong Go to discuss the situation in Marawi City. President Duterte has today (Tuesday, May 23) declared martial law in the island of Mindanao following the attack of the Maute Group in Marawi City. The decree was announced by presidential spokesman Ernesto Abella in Moscow, Russia, at about 11:30pm (Manila time). “He has full confidence in the AFP and PNP’s management of the situation,” Mr Abella said. Foreign Affairs Secretary Alan Peter Cayetano, during the same press conference, said Duterte would cut short his Russia trip following the clashes in Marawi City. Mr Cayetano added that the priority of the president was the safety of people in Mindanao. The martial rule will last for 60 days, unless extended. The move came after the the terrorist Maute Group — believed to be harbouring Islamic State’s leader in the region, Isnilon Hapilon — hoisted the black IS flag over a hospital and set fire to a school and jail building. Defense Secretary Delfin Lorenzana said two soldiers and one police officer were killed, while 12 others were wounded in the ongoing clashes. He added that the terrorists still occupy a street and two bridges leading to Marawi City. Marcos had tens of thousands of political opponents murdered, tortured, and/or imprisoned. “…it would not be any different…”?